CLOSE YOUR EYES and let the melodies of a lost civilization carry you away. The rippling notes of the pipa transport you to an imperial banquet, where maidens dance under a silvery moon. In a sudden shift, powerful drumbeats conjure an ancient battlefield where the valor of heroes shines through. This is a performance that breathes life into precious stories and even melodies from the distant past. Nowhere else can you hear classical Chinese instruments—such as the two-stringed erhu and the piquant pipa—so pleasantly melded with Western strings, woodwinds, and brass. Shen Yun’s approach, from the composition to the expression of the music, results in a vivid sound with great emotional range—perfect for musical storytelling. The New York-based Shen Yun Symphony Orchestra was formed in response to the many theatergoers who longed to hear the music of Shen Yun—the phenomenally successful dance production—in concert form. 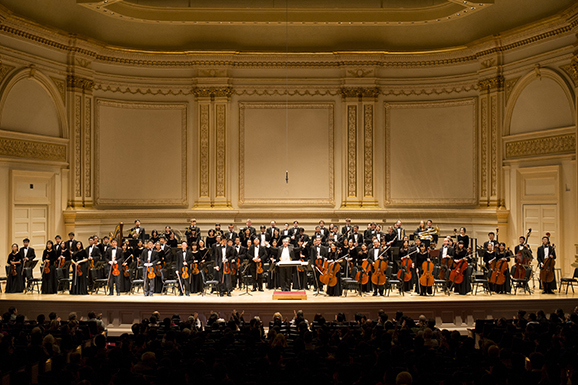 Since debuting at Carnegie Hall in 2012, it has performed to great acclaim worldwide. It is home to an impressive number of internationally accomplished musicians, including its singers, known for their remarkable ability to sing the most traditional bel canto in Chinese. Shen Yun Symphony Orchestra is distinguished by its artistic vision of cultural renewal through works unfailingly positive and bright. This year’s repertoire is a refreshingly diverse and fast-paced experience sure to delight both seasoned concertgoers and those new to classical music. The performance features Shen Yun’s most celebrated original compositions along with timeless orchestral classics by Wagner, Sarasate and Tchaikovsky. “Really out of this world!